"It is never too late to have a happy childhood." Summer is waning, the days are getting shorter, there is a breath of coolness in the air and we fall gently back into the normal rhythm of work, school and family. The seasons change and we are revitalized yet sometimes we yearn for summer vacation to never end. As we sit down for a breather, wrap our hands around a warm mug of coffee and slice ourselves another sliver of cake, we think back to the summers of our childhood, those innocent days when we could wake up every morning, jump out of bed, slip into a swimsuit or shorts and head outside to play without a worry in the world. Biking or kicking a ball around in the street with the other kids while mom made lunch for us, a day trip to the zoo or the circus as it passed through town or packing our bags to head off to grandma’s house where we would be spoiled and pampered as only children can be, summer school holidays were a time of freedom and joy, non-stop amusement and the kind of excitement that can only happen to a kid in the summertime. 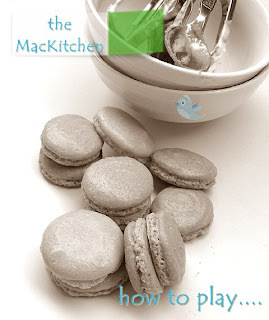 This month’s Mac Attack challenges you to bake a macaron inspired by a childhood summer memory: make your macaron as salty as the waves rushing up over your legs as you dance in the ocean, sweet as the candy apples eaten at a county fair, as fun as the popcorn enjoyed at a drive-in movie (where you would go in your pajamas!) or the circus as it passed through town. Close your eyes and imagine a favorite summer holiday of your youth, whether at camp or at the grandparents, traveling to foreign countries or in your own backyard. Cookouts or beach parties, bonfires or barbecues, 4th of July fireworks or the clowns and confetti at a small-town parade, be inspired by a magical moment in your youth, something that makes you smile, a memory that stirs up scents and flavors of a special time and transform it into a tasty, delicate macaron. Please have your Mac Attack post up no later than Sep 20, 2010. Round up will be on Sep 25, 2010. Mmmmm, I have some ideas and I can't wait! I already know what I will do- it hit me as I read the first paragraph so I've got to run with it. My FIRST Mac Attack! (but far from my first batch of Macs). well I tried this morning with a hand I am not supposed to be cooking with and knew the batter wasn't quite right - couldn't hold the spatula properly. Now my hand is more sore and my macs failed. Think I will use the failed ones in my post anyway in a different recipe. You'll forgive me, won't you? Yaaaayy! I finally get to take part in mac attack with my first colourful assortment of macarons that remind me of the highlight of my childhood summers, going with my cousins to the yearly church festival in Kerala. Hi all, I have posted mine. Was going to do little pink ballerina macarons but Lora bet me to it and I had no way to compete with the cool pic's of her younger self practicing her ballet. Instead I popped my macaron gems in a jewelry box reminiscent of sneaking into my mother's room to try on her 'jewels'. My first Mac Tweet is up! Based my Macs on Fab ice lollies with sprinkles and all, my childhood favourite. Yay! 3 months postpartum and back in mac-making land! Here are mine this month! Looking forward to the round up. My post is up http://barbarabakes.com/2010/09/candy-corn-macaron-for-mactweets/ Thanks ladies! Just discovered this although I follow both your blogs! I would love to join in- not enough time for this challenge but certainly the next. How do I grab the button? Haven't been successful. Simple Summer Memories and Cotton Candy Macarons! I finally got my post done (did the macs last week). Anyway, the challenge was fun, thanks for letting me be part of it. These ones are just for Deeba!!! mine are up! late but up! Hi! I've just opened a new blog on the 20th (I'm a new blogger), I've been following your attacks for months and loving it! I've made macarons the same day (finished piping today). will it be ok if I'll post tomorrow? (23th). Hi! mine are up too. =) I know it's late, but I had to give it another try, and I wanted to make it to this month's attack.. what better way is there to celebrate the new blog? Here is my second entry! ( told you I was so excited about Macattack!) My Chocolate Nutella feetless, bumpy macarons! Imperfect babies, but I still love them so! Hmm maybe I can manage a third entry by the 25th! have some egg whites aging on my kitchen counter! Got a foot in the door, I did, feetless macs, and Chocolate & Cherry Pots de Creme! have you posted them already? You must have... I am so late reading this... I will look. Love the nostalgia. It took me there. For sure. MacAttack 10... a round-up of the Summer Flick!